In this article, we will discuss controllers, action methods, and data sharing between a Controller to View. In the first part of this series, we discussed the basics of MVC, features of MVC, and folder structure of MVC. Check the first part of this series to brush up your basics. In MVC, C stands for Controller. Controller is the most important component of MVC which handles the execution of every request. An MVC Controller acts as a mediator between Model and View. Model communicates with the View through Controller and the application execution process always starts from the Controller. In an MVC application, every Controller is created as a class. A project can have more than one controllers according to our requirement. Controller class should be declared with Public Access Modifier. Controller class name should end with the Controller prefix. All the Controllers should be inherited from the Controller base class which provides the build in Objects, Methods etc. In Controller, at the time of processing a request, it will execute the corresponding method which is called Action Method. Action method is a Controller method which returns some values as a result. Every request that comes in MVC will be handled by action methods in the Controller. Action method contains the application execution logic to process the request. It can’t be static, it must be a non-static method. Action method returns the View() method. View() is used to process the Views. The View() method is a built-in method in the controller class, at execution time view() execute and result will return from the action method. View() method return type is View Result. Action method can be parameterized or parameterless. It can overload but can’t be overridden. Action method with the non-view result: Action method that returns data instead of an HTML Page. It represents a base class that is used to send a partial view to the response. Partial view is a reusable view that is accessible from any view. It represents a base class that is used to send data in JSON format as a response. It controls the processing of application’s action by redirecting to specified URL . It represents a result that performs a redirection by using the specified route values. It can be used to redirect to any controller action within the application. It represents a user-defined content type that is sent as a response to the client. It represents a result that returns nothing, so it will not have any return value. It is a collection object. It stores the data in key-value format. We need to perform typecasting in order to read values from view data because it stores all the values in object format. It is an object of ViewDataDictonary class. Viewbag is introduced in MVC 3.0. In ViewBag, keys are used as properties. The ViewBag concept is developed in dynamic typing. If we use ViewBag, then there is no need to perform type casting. ViewBag is also a object of ViewDataDictonary class. TempData is the same as viewdata, it stores data in object format, but TempData is available in the current action and redirected action. ViewBag and ViewData scope are available in only one action and view. TempData is an object of TempDatadictionary class. 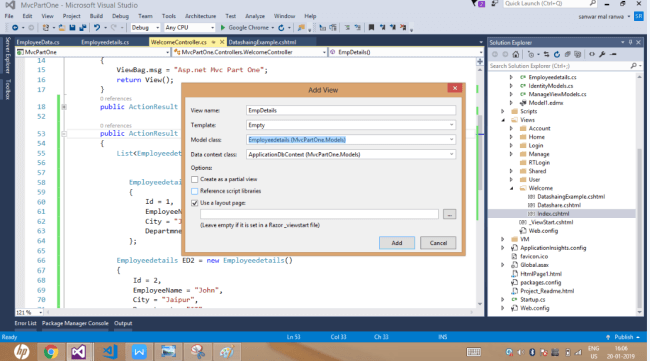 Now, we create an MVC application to use ViewData, ViewBag, and TempData. Let's add an action method into the Welcome controller and add the following lines of code. Now, right click on action method name and add a View. 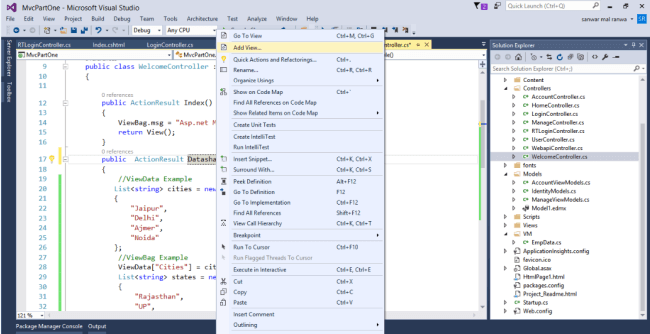 In the View, add the following lines of code to display data from Controller. Run the project and check result. When a View is designed by targeting a specific class, then that View is called Strongly-typed View. In a Strongly-typed View, the View is bound with corresponding model class. Make database related operations easy. To create a Strongly-typed View, first, go to the model folder and add a class. Now, rename it as Employeedetails.cs. Now, add an action method in the Welcome controller, name it as Empdetails, and create a list and add some data in it. Now, right click on the action method and add a View and select the following. Add a table in View and display the data. Add the following code in View. In this article, we learned about Controllers, Action Methods, and data sharing methods between Controller to View in MVC. In the next part of the series, we will discuss models and basics of Entity Framework.